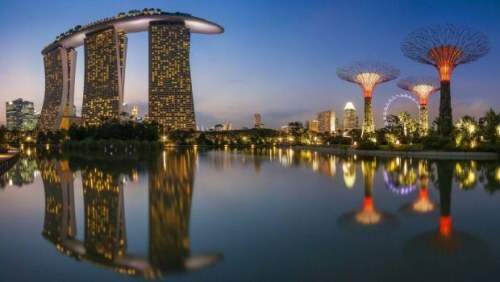 United Airlines and All Nippon Airways (ANA) have dropped the price of their flights from Saskatoon to Singapore down to a ridiculous price of $561 CAD roundtrip including taxes. This is one of those deals that I know some will have trouble believing. It's actually been around from Edmonton, Vancouver, and Toronto for a little while now (see YEGdeals, YVRdeals, YYZdeals, etc). It's been around long enough that I've heard from quite a few people who have booked it and confirmed their tickets directly with the airline. Make no mistake, Singapore is a *long* journey from Saskatoon. Even the fastest flights require 24 hours of travel to get there. Some flights are with United Airlines, others are with All Nippon Airways (ANA) - or a combination of both. The flights with ANA are definitely preferred (great airline, ranked as a 5* airline). Below, I've pointed out the dates that use ANA both ways. Also keep in mind that it's pretty easy to fly from Singapore to other places in SE Asia for a very low price. For example, Singapore to Bangkok, Thailand is usually around $50 CAD each way on AirAsia. Singapore to Denpasar, Indonesia (Bali) or Phnom Penh, Cambodia is usually around $70 CAD each way on AirAsia or Jetstar. Or Singapore to Perth, Australia on Scoot for $125 CAD each way. You can even reach as far as the Maldives (MLE) for $150 CAD each way on TigerAir. Gate1.ca only started showing up on Momondo about 6 months ago as a partner booking site, but they are actually owned by tix.nl (you can see this on their contact page). 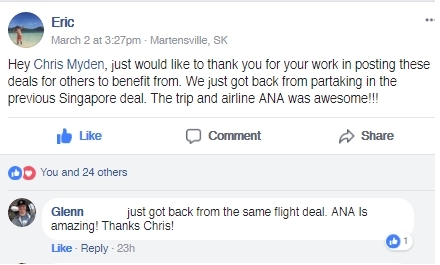 Now that this deal has been around for a little while from multiple Canadian cities, I have heard from people who have booked these flights through Gate1.ca, and received their booking #, which they used to confirm their booking on the ANA website. saskatoon, yxe, flight deals, asia, southeast asia, united airlines, singapore, sin, all nippon airways and ana.